“WrestleMania Weekend” has become a major phrase in the lexicon of the wrestling community. Whether you are a devoted WWE fan or a diehard of the independent scene, there is plenty to take in during the days leading up to the Showcase of the Immortals. As you prepare to dive into some of the things being offered up outside of a WWE ring, let The Lady J be your guide. Philadelphia-based Chikara has been around since 2002, which is a long time in terms of the life of a wrestling promotion. It’s been four years since they participated in any of the events leading up to WrestleMania, and this year they’re bringing two jam-packed shows to the WWN Live experience in Orlando. Fifteen years of content sounds like a lot to work through in just a few days, so let’s see if we can’t boil down to the essentials before you attend or tune in. If you’re completely unfamiliar with Chikara as a promotion and what they’re about, know first and foremost that you must suspend your disbelief before you experience any of their shows. There will be a colony of ants in the ring, most likely wrestling a goblin, facing off against a tag team of ice creams or narrowly escaping a hermit crab. A tiny sugar creature might slay a giant or team up with two professional cyclists, all under the watchful eye of a sorcerer, recently released from the power of an evil force called Nazmaldun. Chikara tells some pretty intense stories using fun (and occasionally terrifying) characters to paint a vivid picture for their audience. Show up to have fun and you won’t be disappointed. Chikara is a family-friendly wrestling promotion. This is a strictly-enforced policy, complete with audience policing. There is absolutely no swearing of any kind. If you do swear, whether in the crowd or in the ring, you will be booed. If you’re a fan who insists on chanting swear words, expect to be warned, and then removed. Whenever attending any wrestling promotion for the first time, make sure you familiarize yourself with the rules. Currently boasting a roster of more than 50 in-ring competitors, plus staff, it may seem like an impossible task to immerse yourself in the Chikara experience without getting lost or confused. Fear not! A quick peek at the Chikara roster page will help you parse the good guys from the bad: The names of the técnicos (babyfaces) appear in blue, while the rudos (heels) are in red. As far as we can tell, these affiliations are up-to-date. On Feb. 4, Chikara kicked off their 2017 season with a free event supporting the Superkick Foundation charity called National Pro Wrestling Day. At that show, we were introduced to a host of new characters, as well as some top-secret surprises. 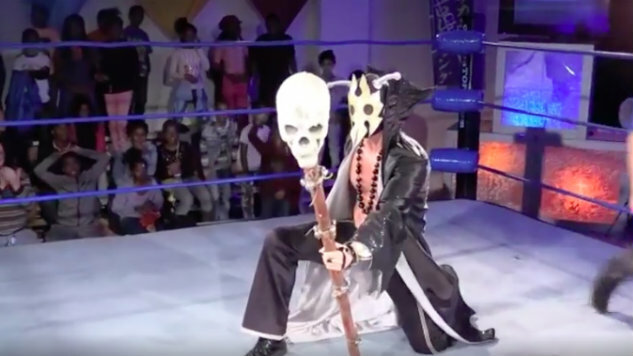 Probably the most shocking revelation came when it was revealed that Ultramantis Black (the aforementioned no-longer-evil sorcerer) was now the Chikara Grand Champion. When the 2016 season ended, Hallowicked (a foul, pumpkin-masked villain who had placed the Eye of Tier on Ultramantis, thus making him evil) was the holder of Chikara’s main championship. When had the title match happened? What was going on? Soon, beloved ring announcer Vlad Radinov made everything clear: in between December of 2016 and February of 2017, Chikara recorded a secret season known as Season 17, which would be released via Chikara’s on-demand service, Chikaratopia, in the coming weeks. The final installment of the Season 17 episodes will be released on Friday, so if you have enough time to binge all of it before 8 p.m. EST that night, you’ll go into the two Chikara shows this weekend with all of the missing pieces in their rightful place. In Chikara, their tag team titles are known as the Campeonatos de Parejas and are currently held by a tag team known as Crummels and Defarge. Cornelius Crummels and Sonny Defarge are two Dickensian-era businessmen with horrible hygiene and a penchant for sneezing on their opponents. Debuting nearly a year ago at an Hour of Power, these two Typhoid Murphys had to overcome an intense feud with another new team, cyclists Donald Kluger and Jasper Tippins of Dez Peloton before eventually conquering previous titleholders Mustache Mountain. Chikara works off of a points system, with the winner of each match earning one point, unless otherwise stated. When an individual or tag team reaches three points, they can challenge for a title, so Crummels and Defarge will be defending their titles in Florida against a team that has recently worked themselves to three points. After Dustin lost the trademark on the name Chuck Taylor, it was snatched up by sly businessman Chuck Taylor™. Dustin and Chuck Taylor™ are an unwilling pair at best, but should be worthy opponents for the slightly gross yet highly vicious Crummels and Defarge. A major component of February’s National Pro Wrestling Day show was the Young Lions’ Cup Tournament. This year’s tournament winner, Space Monkey, was the 19th winner of the trophy bestowed upon the best of the young and up-and-coming talent of Chikara. Between Young Lions Cup tournaments, the trophy itself is defended as a title would be. Space Monkey will face Wani, a hard-hitting young talent who came so close to winning the trophy himself in the 2016 tournament, only to be defeated in the final by the Estonian ThunderFrog. We can only imagine how hungry Wani is for his shot at redemption. Here’s hoping Space Monkey is hungry for something more than a banana.